Sometimes, people get the idea that they have to learn dozens of throws to correspond with each weakness in their opponent… He spreads his legs too far, Uchimata… he steps too far forward, Kouchigari… he side steps with his feet too close, Okuriashibarai… and so on. Kuzushi - Beginning and Advanced Concepts. Kuzushi is integral to Judo, and is taught right from the very beginning, but as I’ll discuss here, there are different forms of Kuzushi, and different ways to apply it. Most martial arts are afflicted with ‘em. I well recall as a young Ikkyu meeting a 20 something year old Marine, holding a 7th degree belt in some arcane art, who informed me that his art was so deadly, that he could not step on the mat with me. Kuzushi & Tsukuri, or the Chicken and Egg Problem. We’ve all learned the traditional mantra: Kuzushi, Tsukuri, Kake. Or, as I commonly consider it in English, Breaking my opponent’s balance, Fitting in for the throw, and the execution of the throw. We’ve probably all used the example of looking at our “wristwatch”, while executing the kuzushi pull for a forward throw… when teaching. In boxing, the left jab is used to open up an opponent for the powerhouse right hand. I like to think that Judo’s ashiwaza serves the same purpose. Let’s face it, you’re not going to create the sort of kuzushi that you need against a fellow black belt in competition as easily as you can against a white belt… you need to either force or trick him into a mistake. There are several ways to ‘force’ your opponent into a momentary loss of balance, and ashiwaza is one of the major methods. Right-Handed Judoka - Left-Handed Grips. Those who know me know that although I’m right-handed, I prefer fighting left-handed. There are a number of reasons for this - one of the major reasons being that most people don’t know how to handle “lefty’s”. Kusabi Dome … Now Illegal?? 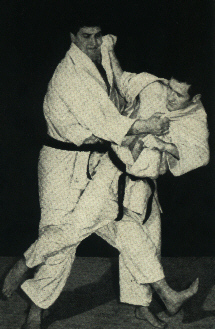 I just learned at last practice that Kusabi Dome (shown here by Anton Geesink), the ‘wedge block’ technique used to block Harai Goshi (and other similar forward throws) has now been made illegal in the U.S. This news was given to me by a nationally ranked referee. 1. Be in exemplary cardiovascular condition. 2. Have a technique-oriented mindset. Bad Uchikomi - Do You Do This? The words you use to characterize things will often give unintended meaning… a question that came up on the Judo Forum was asking if Judo clubs should teach “illegal” Judo techniques.